Posted May 25, 2018 by Joe Loizzo. Category: Interviews. Keywords: Polyvagal Theory • Stephen Porges. Recently I had the rare opportunity to interview one of the rising stars of the new neuroscience, Dr. Stephen Porges, the lone pioneer of the latest research on the unique role of the autonomic nervous system in human life. Many of you have heard me repeatedly try to convey the revolutionary impact of his work on the main neural governor of our body states, moods, mind states, and responses. So you can imagine how thrilled I was that he agreed to speak at our upcoming Annual Benefit, and to spend an hour of his time with me sharing his journey of discovery and reflecting on his work’s relevance to science, psychotherapy, contemplation, and contemporary life. What I learned in that interview came as no surprise: Dr. Porges is the real deal, a rigorous researcher whose work is transforming our view of human physiology and health and will impact science for decades if not centuries to come. The surprise was to find that Stephen also happens to be a vital, creative child of the 1960’s—a humanist at heart who followed his passion for music deep into the evolutionary sources and innermost mysteries of human life: the healing, connective power of fearless presence, awe, and love. I’d like to share with you a few excerpts from our interview, and hope that they will whet your appetite to hear more from this inspiring pioneer at our 9th Annual Benefit on June 8th! Posted April 17, 2018 by Joe Loizzo. Category: Interviews. Keywords: Neuroscience • Polyvagal Theory • Stephen Porges • Yoga. I am delighted to be able to share with you two excerpts from the exciting new book penned by our dear friend Dr. Pilar Jennings. Many of you know Pilar already from her incredibly clear and kind teaching as a core faculty member in our Sustainable Happiness Program and our Contemplative Psychotherapy Program, or from our last Annual Benefit. In To Heal a Wounded Heart, Pilar has outdone herself, bringing her incomparably wise and nurturing voice ever deeper into the intimate realm where Buddhism and psychotherapy meet to turn trauma into wholeness. We know this taste of Pilar’s heartfelt reflections on her encounters with clients and with her guru will whet your appetite for the whole feast. 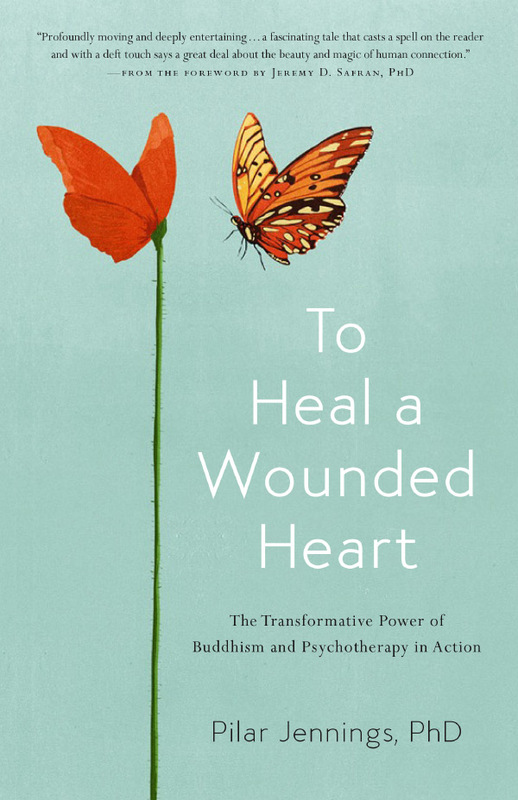 To Heal a Wounded Heart: The Transformative Power of Buddhism and Psychotherapy in Action is available on Amazon*. Ten years ago I made a decision I could not have anticipated in my years of training to become a psychoanalyst. I brought my Buddhist teacher and best friend into treatment with my first patient. The idea was to offer Martine, a six-year-old girl I quickly fell in love with, a sense that even the worst losses can be survived. Lama Pema knew something about grizzly loss and extreme vulnerability. As a child living in Tibet, on the eve of the Chinese invasion, he lost his country, his parents, and even a sense of self still fragile and easily dismantled. Martine’s losses were more chronic—an addicted mother who flitted in and out of her life, who tantalized her with loving but unreliable attention, and an elderly grandmother who held on tight, determined to keep her from the outside world where danger lurked. Posted April 9, 2018 by Joe Loizzo. Category: Books. Keywords: Pilar Jennings • To Heal a Wounded Heart. In recent months and years, the young transplant of Tibetan Buddhism in the West has suffered several shocks that have shaken sapling communities in the U.S., and troubled the larger community of Buddhist orders around the world. Given the public controversy and deeply personal introspection stirred by these shocks, including the recent statement by Dzongsar Khyentse Rinpoche, I believe the time is right for us as a community to seriously reflect on what they can teach us about the global future of Tibet’s unique culture and its little understood Vajrayana form of Buddhism, also known as Buddhist Tantra. Posted September 7, 2017 by Joe Loizzo. Category: Article. Keywords: Guru.